17th Year in Fire Island Pines harbor! WE HAVE THE MOST EXCLUSIVE LISTINGS for SALE and RENT in Fire Island Pines! Click on either SALES, SEASONAL RENTALS, MONTHLY RENTALS or WEEKLY RENTALS on the top of this homepage for our updated available listings. FIRE ISLAND PINES remains the best investment you can possibly make , with only 650 homes, mostly all owned by two income partners, the market remains strong. We are a magical island that is so idyllic but just an hour away from New York City! THE ONE INVESTMENT THAT REMAINS SAFE AND SECURE AND PROVIDES A LIFETIME OF HAPPINESS! With interest rates low, and our property values secure, NOW IS THE TIME TO PURCHASE, PRIOR TO THE INCOMING UNITED STATES GOVERNMENT SAND REPLENISHMENT PROJECT scheduled for 2019 that will replenish our Dunes significantly. 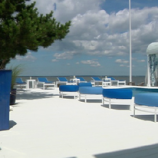 This will increase property values enormously throughout the entire Fire Island Pines community! We are open 52 weeks a year, 7 days a week! Jon Wilner, Broker, Island Properties of the Pines, Inc. Enter your email and specify your interest; we'll do the rest for you!